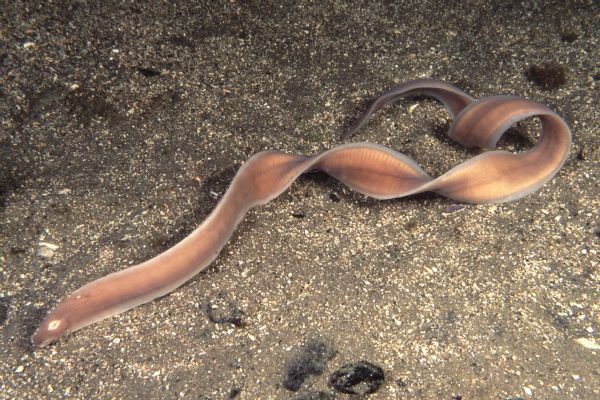 The ribbon worm is a long, thin organism with a worm-like body. They commonly reach lengths between 5 and 10 meters, but have been found at lengths of 30 meters. Its color varies from dark brown to black with beige stripes running along its body. They are slow movers and use their external cilia to glide on surfaces, leaving behind a trail of slime. They feed on annelids, clams and crustaceans. Respiration is conducted through diffusion rather than through gill-like structures. Ribbon worms are able to regenerate when fragmented. Marine species have separate male and female sexes. Freshwater species are all hermaphroditic. The ribbon worm can be found along the coast of Europe and the Mediterranean. They typically inhabit the lower shore shore amongst boulders and crevices. A few species of ribbon worm are used as fish bait by anglers. "Giant Ribbon Worm - Lineus longissimus". Seawater. Retrieved from: http://www.seawater.no/fauna/nemertea/longissimus.html.